Lobster-bacon pancakes with scallions and ginger plum sauce. Like chain-smoking and wingsuit-flying, consuming large quantities of fried bacon is not associated with a long and healthy life. So we must have been feeling immortal this month when we stopped into Olde Magoun’s Saloon in Somerville, browsed its special bacon menu, and ordered everything on it. Featuring America’s favorite artery-clogging food, the Magoun Square tavern’s fifth “Baconpalooza” is showcasing bacon every which way, from jalapeño bacon to lacquered pork belly. The unusual dining opportunity takes place every Wednesday evening in July. Olde Magoun’s Saloon doesn’t hold a bacon-eating contest, as a New York City art gallery did not long ago, but it is offering plenty of bacony twists on familiar comfort foods. 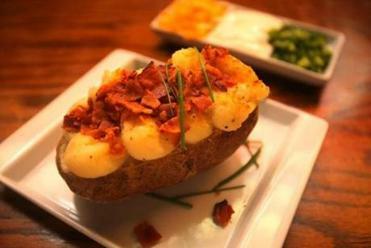 The dozen items on the pub’s special menu range in price from $6 for bacon deviled eggs to $16 for bacon mac and cheese. Our party of six arrived for the Baconpalooza kickoff at 5:30 p.m. sharp on July 2. We half-expected to find a line with lawn chairs at the door; instead, we had the place mostly to ourselves. Maybe the crowd arrives later, we figured. After ordering our food, we waited half an hour for it to start arriving, which was odd considering how few other tables were occupied. We passed the time enjoying drinks from Magoun’s extensive wine and beer list. As bacon martinis weren’t offered, we tried a smoky German draft on the special menu, called Aecht Schlenkerla Rauchbier. I swore it was bacon-flavored; no one else agreed. The food in general was enjoyable without being especially memorable. An appetizer of figs wrapped in bacon and stuffed with goat cheese ($10) had an interesting mix of ingredients, but nothing stood out. More abundant or pungent cheese might have helped. The twice-baked bacon potato ($8) had been scooped out and whipped with chive sour cream, then put back into the baked skin with a smattering of bacon. It wasn’t exciting, but it wasn’t trying to be — it was an $8 potato. The bacon mac and cheese was everyone’s favorite, in an over-the-top kind of way. With several types of bacon (including jalapeño bacon, smoked bacon, and pancetta) and plenty of cheese, the dish had as much salt, fat, and crispiness as anyone could ask for. “It’s so bad for you — that’s why it’s so good,” one of our party observed. The lobster-bacon-scallion pancakes ($12) were another guilty pleasure. 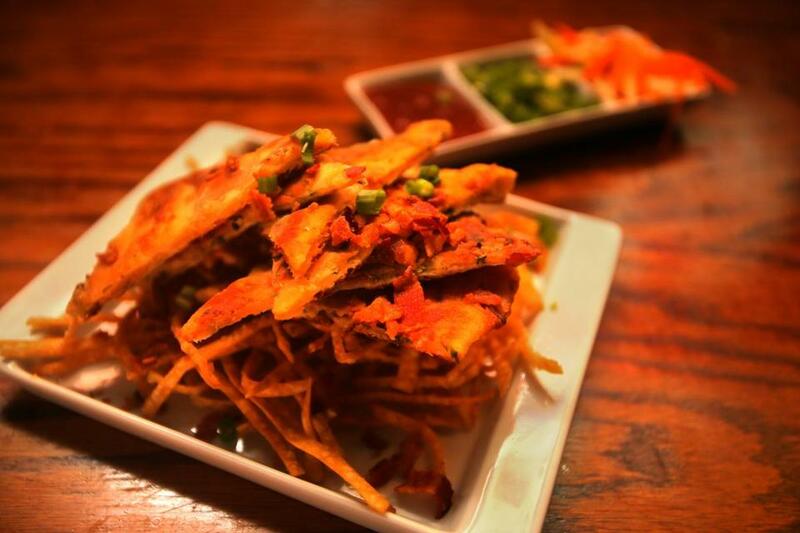 They came with shoestring fries, almost like wonton strips. Most of us enjoyed the dish, even if we couldn’t detect any lobster. The pancakes’ dryness, more like toasted pita than griddle cakes, was remedied by a side dish of ginger plum sauce — hot, tangy, and sweet. Less popular were the chicharrónes ($10). This dish usually uses pork rinds, but Magoun’s version consisted of slab bacon in big, salty, overcooked chunks, which were hard and dry. Fortunately for us, several items on the special menu, such as the bacon and shrimp pad Thai ($14), had a modest amount of crumbled bacon, not big slabs of it. This added that all-important bacon flavor without raising the risk of immediate heart attack. The pad Thai used fresh ingredients — bean sprouts, cilantro, parsley — but wasn’t terribly flavorful. One of our party, an Asian-food cook, guessed that the chef hadn’t used fish sauce. A general favorite was the bacon bánh mì ($12), a variation on the traditional Vietnamese sandwich featuring laquered pork belly. The fresh veggies in the Asian-style coleslaw were a welcome contrast to the salt- and fat-laden foodstuffs crowding our table. Indeed, one of the drawbacks of attending a bacon fest and ordering everything on the menu is that, toward the end, you wince rather than salivate as new dishes appear. A mound of bacon poutine ($10), crisp waffle fries served with bacon gravy and cheese curds and topped with a soft-fried egg, elicited groans from several of us when it arrived. Then we gobbled it up. We ended with bacon bread pudding ($7), which came with bourbon-flavored ice cream, hot salted caramel sauce, and bits of maple-cured bacon. Hot and cold, salty and sweet — we all jammed in our spoons, even knowing it was bad for us. That’s what made it so good.